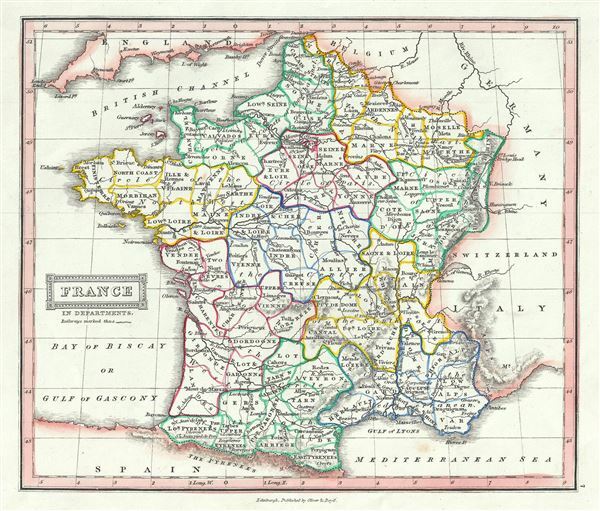 This is an example of Thomas Ewing's 1845 map of France. The map divides France into its constituent Departments. It covers from the Nord in the north to eastern Pyrenees in the south and from Finistere in the west to Upper and Lower Rhein in the east. Various towns, cities, rivers, roads, railways, mountains and several other topographical details are noted with relief rendered by hachure. The French Department system was established on March 4th, 1790 by theÂ National Constituent AssemblyÂ to replace the provinces with what the Assembly deemed a more rational structure. They were designed to deliberately break up France's historical regions in an attempt to erase cultural differences and build a more homogeneous nation. Initially there were 83 departments but by 1800 that number increased to roughly 130. Many of the departments that were created in 1790 remain the administrative districts to this day. Nonetheless, the province system was so engrained that most cartographers felt obliged to include two maps of France in their atlases, one showing the current department system, and another defining the defunct provinces.